In 1919, residents in the growing townsite of Banff were invited to a community meeting to discuss the fate of the Bow River Bridge. The single-lane iron truss bridge connecting Banff Avenue to the Brett Sanitorium dated back to 1887, when the new Park Superintendent George Stewart had commissioned the town’s first permanent bridge to transport visitors from the train station to the Cave and Basin Hot Springs and the Banff Springs Hotel. By the 1910s, when automobiles were first allowed in the park, the bridge was considered “unsightly and dangerous”, and plans were underway to replace it. Park administrators commissioned City Beautiful town planner Thomas Mawson to design a plan for the townsite’s redevelopment, complete with drawings for a grand bridge to replace the original, but in the summer of 1914 war broke out in Europe, and the project was put on hold. 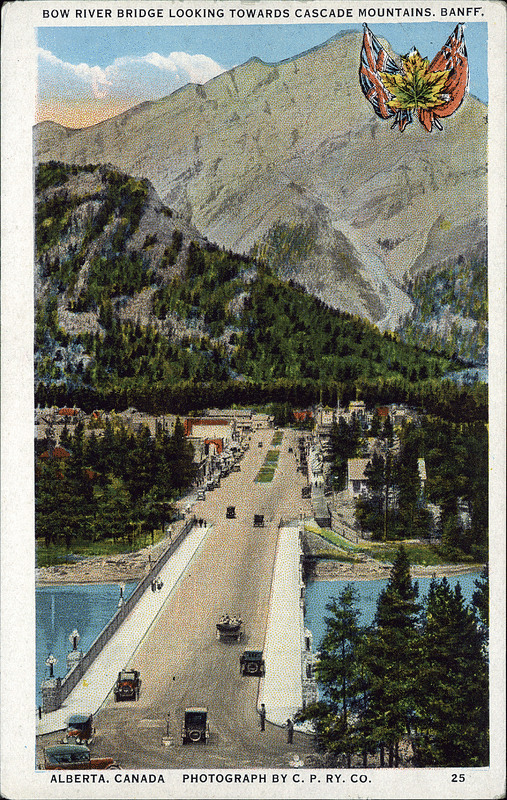 The bridge was built between 1920 and 1921, providing employment and a welcome payroll for many Banff residents through the winter months. The final plans featured a slightly reduced 36 ft. roadway, stone facing on the steel and concrete for the appearance of a solid stone bridge, and six concrete-cast reliefs of an unknown First Nations man, designed by the sculptor also responsible for the lions cast on Calgary’s Centre Street Bridge. For almost a century, the stone and concrete Bow River Bridge has been a landmark in Banff, creating iconic axial views along the length of Banff Avenue toward the base of Cascade Mountain, and of the river and mountains in all directions. The bridge’s grand span, its globe lamp posts and First Nations reliefs feature prominently in tourist photographs and local postcards. The bridge’s roadway was designed with such width that it allowed for the addition of a third lane in 1987, in the hopes of moving a growing number of visitors across the river. Yet the bridge’s aesthetic balance remains, still retaining its historically significant appearance as a two-lane automobile and pedestrian bridge in the grand boulevard City Beautiful style.